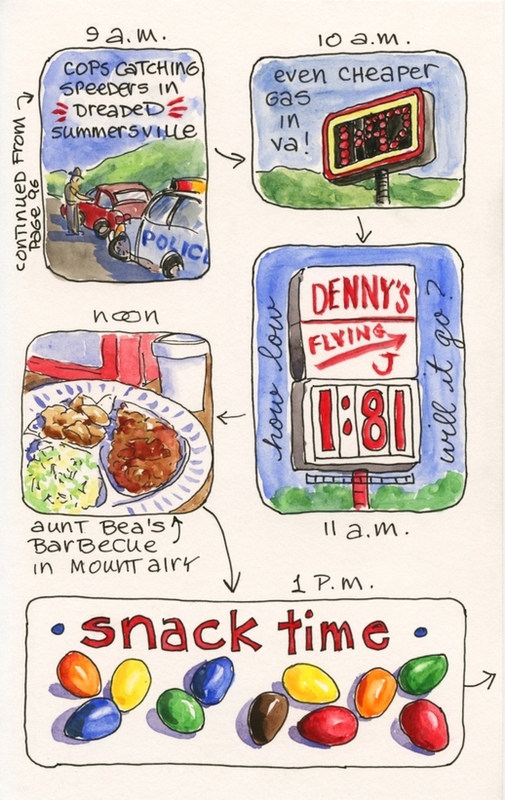 I've been finishing up some of the sketches I did while in Maine earlier this summer, and it's been a lot of fun reliving that special time that I shared with my mother and five students. Three of them flew all the way from California to be there! I added this year's sketches to the sketchbook that I started last year in Maine, but I gave this section its own title page. (See the 2015 sketches here.) The design was drawn with five different colors of Sakura Gelly Roll pens on a prepainted watercolor background. The lettering was done with watercolor. Primrose Cottage, where we stayed, is such a beautiful old house, with lots of character. This year I sketched some of my favorite details. 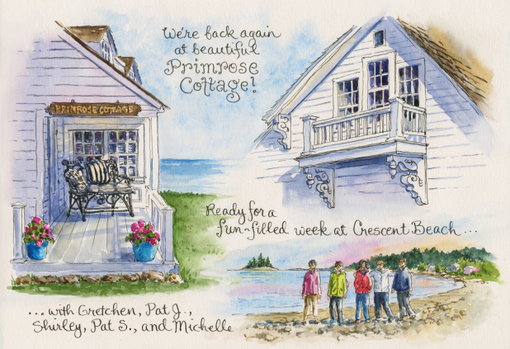 A tiny sketch of my students during their first walk on Crescent Beach rounded out this composite page nicely. 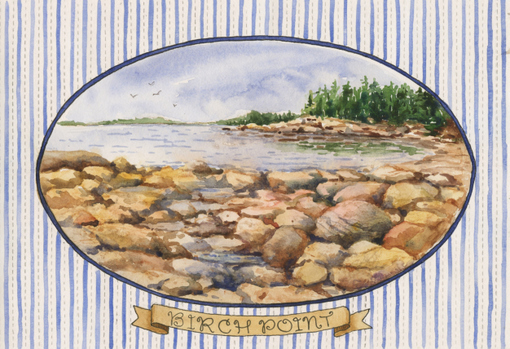 Our first outing was to Birch Point State Park, where I did a sketch with watercolor pencil then painted it with watercolor while several of the students sketched alongside me. It was a cool blustery day, and by the time we finished, everyone was ready to go back to Primrose Cottage for a hot cup of tea. I used self-adhesive mesh drywall tape to make pencil guidelines for my vertical stripes. After I painted the blue stripes freehand with a brush, I decided not to erase my guidelines. I like the way it gives the look of a ticking stripe. Usually I use the mesh drywall tape horizontally to make straight guidelines for text, but using it vertically gave me a new appreciation for the versatility of this tool. I always keep a piece of it handy, stuck to the Coroplast board that I use as a lap desk. You're going to love tomorrow's post! 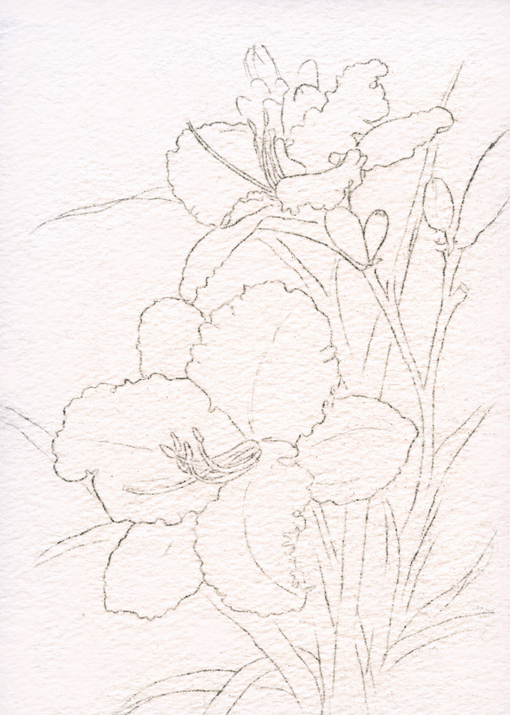 I'll be sharing a step-by-step tutorial showing my process for painting a stand of beautiful purple irises on location at Merryspring Nature center in Camden, Maine. 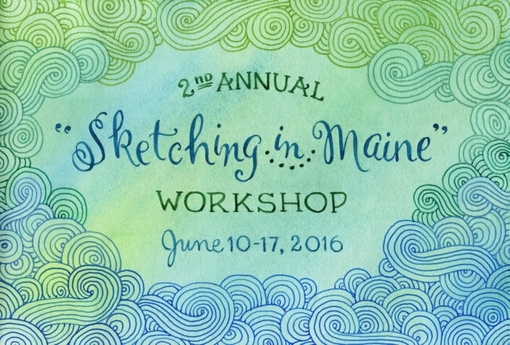 When I taught my Maine workshop a few weeks ago, I had to do all the driving to Maine and back - 16 hours each way. I generally don't enjoy driving on a long trip. It's boring, exhausting, and sometimes frustrating, like the time I blindly followed my GPS into a traffic jam in the Bronx! 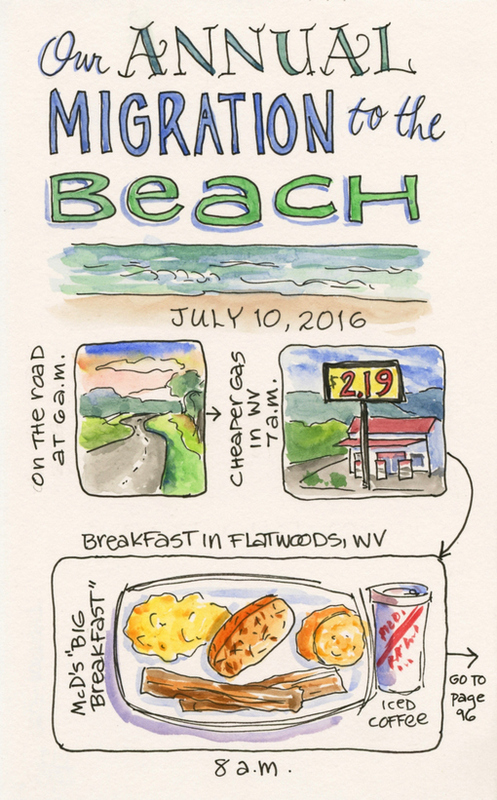 But when we go on our annual beach vacation to North Carolina each summer, I get to sit back and relax in the co-pilot's seat, because my generous husband does all the driving. I read magazines, watch the passing scenery, drink coffee, talk to my mom in the back seat, and sketch. 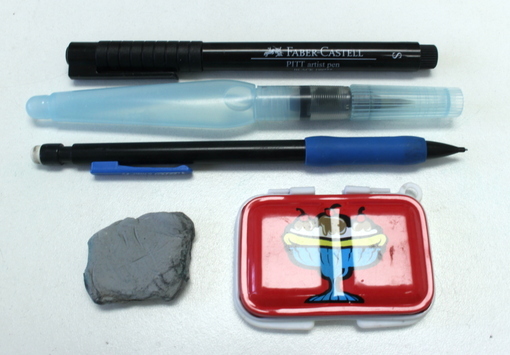 ...just a pencil, eraser, pen, water brush, and tiny toy watercolor set. This one was given to me by one of the students in my Maine workshop. (Thanks again, Gretchen!) 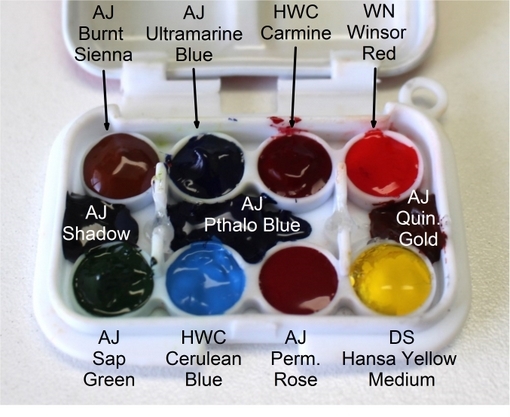 I found them on Wet Paint's website here. This is a party favor type of watercolor set, so the paints it comes with are not the greatest, but I decided to use them for these trip sketches just so I could try them out. I found them to be a little gritty, and they probably aren't lightfast, but the colors were fairly rich, and I enjoyed using them. 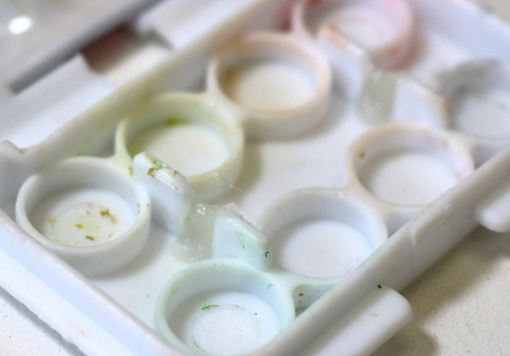 I thought I wouldn't like the small size of the palette, since I usually like a generous mixing area, but when I wanted to switch colors, I just wiped the mixing area clean with a tissue, so it wasn't a problem at all. 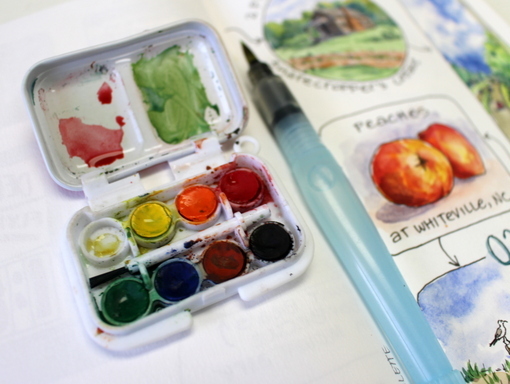 This little baby-size palette was a lot of fun, and I quickly got used to its small size. 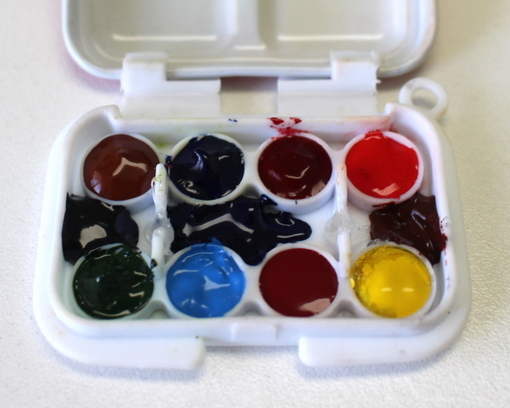 It was handy to be able to just hold it in the palm of my hand to paint, and it easily fits in a pocket of my purse. and replaced them with artists' quality watercolors. I created three additional wells by using a hot glue gun to build a "dam" in the gap that originally held a tiny paint brush. 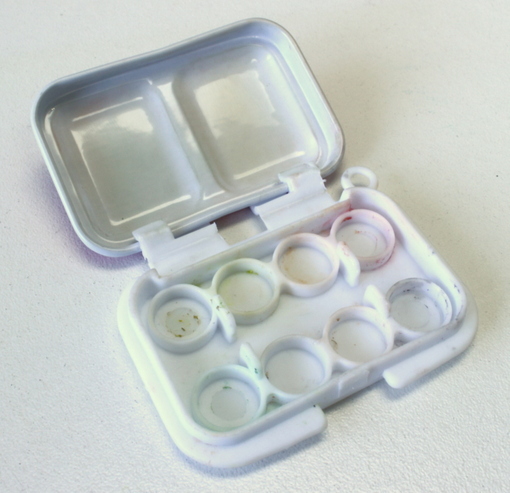 It might be nice to have several of these little sets, each with a different selection of colors. I think I might just need to send in an order to Wet Paint sometime soon! Every month I host "Sketching at Summerhill" here at my house. It offers an opportunity for my creative friends to get together, learn a little something, paint a bit, and enjoy some fun and fellowship away from the daily grind. I love having everyone come to my home in the summertime when the flowers are in bloom, but this month I took my show on the road to a beautiful garden just a few miles away. My friend, Jan, is the creator of this wonderland. She designed it, planted it, and cares for it daily. It's a big job, but she loves it, and, best of all, she loves to share it with others! She graciously offered to host our monthly sketching get-together for July, and the sketchers were really excited about the prospect of getting to see this amazing space. We had such a great time, from the moment we walked through the wrought iron gates into the backyard. There was so much to see! and over 100 varieties of daylilies! We tried to see everything, but there was just too much! We kept discovering fun surprises, like a collection of glass suncatchers on a fence or an antique washtub overflowing with petunias. Jan's sense of humor and eye for design have made her garden a treasure. After wandering around the yard for awhile, we headed for our temporary classroom, a.k.a. Jan's garage. 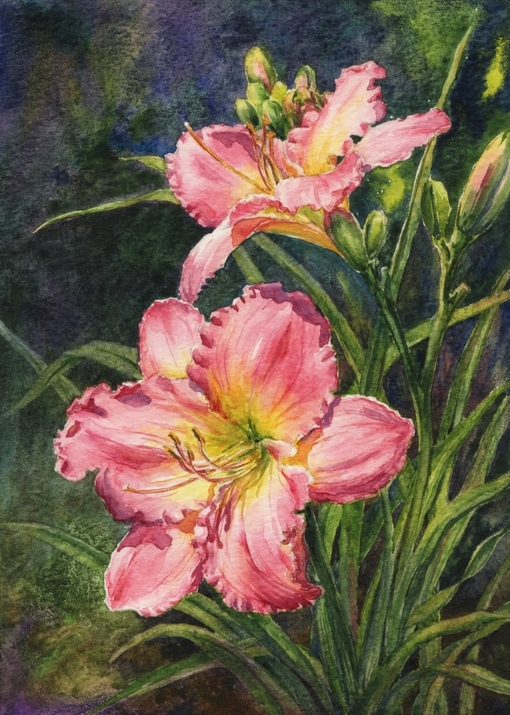 After I explained the painting process, some of the students went out to the garden to sketch, some picked a daylily blossom and brought it into our "studio" to paint, and others painted from photos they had taken with their phone or tablet. We worked up a hearty appetite with all that sketching, so everyone was happy to set aside their paints for awhile to enjoy an al fresco lunch. A few daring women even tried nibbling on daylily blossoms after our host told us that they are edible! Jan treated us to berry buckle with vanilla ice cream for dessert. The buckle was made with a combination of blueberries, blackberries, and red raspberries, plus black raspberries she picked on her property. After lunch, we painted some more. The pace was relaxed. A nice breeze drifted through the studio while classical music played in the background. I walked around and helped anyone who needed it. What a blissful way to spend an afternoon! Then it was sharing time. 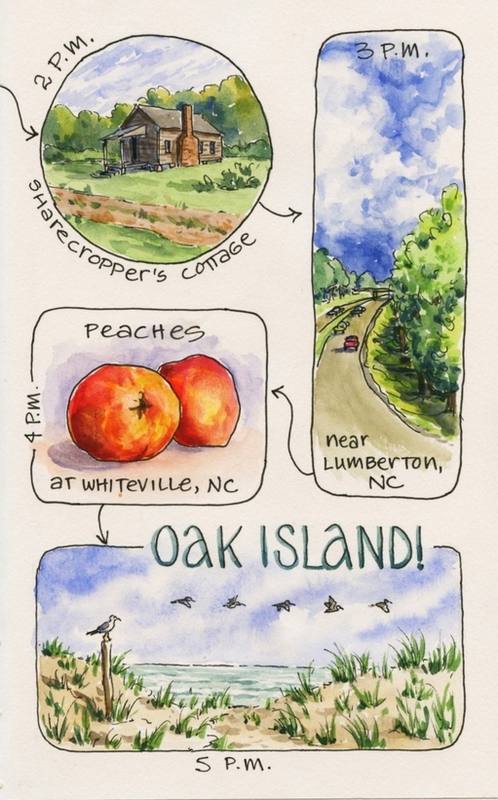 Several of my Summerhill Sketchers did an alphabet challenge during the month of June, and they brought their completed (or nearly complete) sketches to share. It was amazing to see how much they accomplished in such a short time. They all spoke about how they could see a huge amount of progress in their drawing and painting skills as a result of the time invested. Practice is the key! I loved the water and reflections on this "F"lamingo sketch of Cathy's. And Colleen takes her sketchbook everywhere with her now, including when she volunteered at an arts festival in Pittsburgh. She's fearless! Next month we'll be back at Summerhill for sketching on August 4, and this interlude in Jan's garden will be a happy memory for all of us. If you'd like to experience a little bit of our summer garden party, why not try making this delicious Corn and Basil Tart? Here's the recipe, just for you! 1. Make the cornmeal crust: In a medium bowl, beat the butter with an electric mixer for 30 seconds. Add sugar and ½ tsp. salt. Beat until combined. Beat in 1 egg until combined. Add in cornmeal and flour. Mix until ingredients form moist clumps or a ball. 2. Preheat oven to 350º. Pat the dough onto the bottom and up the sides of a 9-inch tart pan with removable bottom. Line the pastry with a double thickness of foil and bake 10 minutes; remove foil. Bake 5-6 minutes more. 3. Meanwhile, in a medium bowl, whisk together 2 eggs and half-and-half. Stir in the corn, cheese, basil, ½ tsp. salt, and pepper. Add any additional optional ingredients. 4. Pour into prebaked pastry shell. Bake 35-40 minutes or until set. Let stand 10 minutes. Remove sides of pan to serve. 5. Sprinkle with tomato and additional basil, or with salsa. Hand-Lettered Quote #6 + Print Giveaway! Hand-Lettered Quote #5 + Print Giveaway! Hand-Lettered Quote #4 + Print Giveaway!